Happy Monday lovelies, how was your weekend, hope you had amazing time. Today I want to share with you my thoughts on this Estee Lauder Nutritious Vitality8 Collection. I've been using on and off these products last few months. This is one of the newest skincare lines from Estee Lauder, I think, and I was very excited to give them a try. 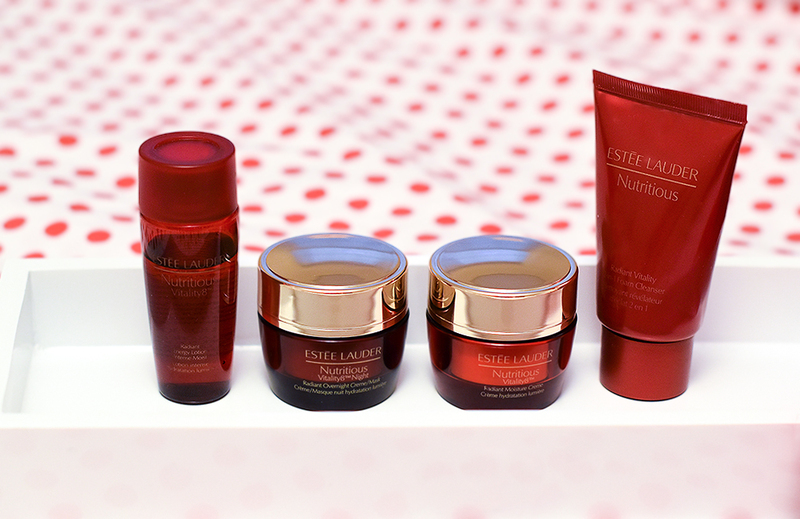 The label describes this collection as a power of 8 , 8 days, 8 dimensions of radiantly healthy skin. It also says that this Nutritious Vitality8 Collection is infused with Estee Lauder's exclusive Pomegranate8 Complex to keep the skin Nourished, Energized, Hydrated, Calmed and Smooth. Now, let me share my thoughs with you: Nutritious Vitality8 Collection is full of fragrance and alcohol, so you can imagine how harsh these products can be for dry, sensitive skin. The worst product among these is Nutritious Radiant Vitality 2-in-1 Foam Cleanser __ it applies quite nicely, actually, and takes off all the makeup, but it's so harsh for my dry, sensitive skin that every time I used this cleanser, my skin becomes extremely dry and irritated. Radiant Energy Lotion Intense Moist can be useful for people who don't have sensitive skin, I liked this product at the beginning, I used to tap it gently on my cleansed face, it always absorbed right away and always gave my skin some glowand hydration. But soon, I realised, that after few hours, my skin was getting some rashes and the reason for that was this Estee Lauder Radiant Energy Lotion Intense Moist. Now let me talk about these two moisturizers from Nutritious Vitality8 Collection: Radiant Moisture Creme is a lightweight moisturizer that should have no problem to absorb into the skin, but unfortunately, it doesn't absorb completely, and because of that, it feels and looks absolutely greasy. On top of that, it irritates my skin. Unlike Radiant Moisture Creme, this Radiant Overnight Creme/Mask works better for me. It's little heavy for my face, so I use it on my neck and I like how moisturizing and quick absorbing it is. Overall, I'm not impressed with this Estee Lauder Nutritious Vitality8 Collection, so I'm glad these products were part of the gift-with-purchase campaigh and I didn't have to pay for them. I believe, they are overpriced, not to mention that they are extremply irritating for sensitive skin. Have you tried any of these products? Let me know int he comments below and have a fabulous day. Thank you so much for your review. We often think that because it is expensive it will work well but it is not always the situation like this! It's beautiful. Estee Lauder has been around for ages because it's a great product. Hi Nina! Thank you for the review! I hope that you have a beautiful week ahead! I love this review thanks for sharing, have a great week! Ouch, what a shame that these didn't work for you, Nina but thank you for your honest review! I love this brand, great products! Glad to hear a great honest review - I have such sensitive skin so good to know! I haven't tried these products but after this review definitely wouldn't get them as I have dry skin. This was a great honest review, although it's disappointing they didn't work out for you. Thanks for such an in depth review! I've seen these before and I love the luxurious packaging. Too bad these were not what you expected to be and yes, they are a bit overpriced. 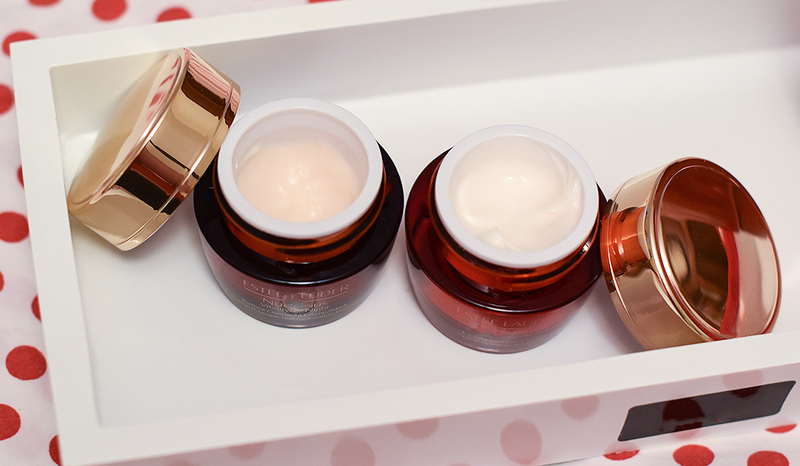 Interesting, I usually love Estée Lauder skincare, but I haven't tried this range yet! It's such a shame for the 2 in 1 Foam Cleanser as Estée Lauder does some great cleanser for sensitive or/and dry skin! I'll still keep in mind the Radiant Overnight Cream/Mask as I love heavy and thick consistencies for my nighttime skincare routine! This is one of my favorite brands! I watched my mom use this brand growing up and I still love them. Thank you for sharing your honest review with us! Mmm... I have sensitive skin, so if you are not impressed and that seems to be overpriced, I thank you for telling it! I like Estee Lauder and it has some good products, and in the beginning of the post I thought this one could be good too, but then I will pass :) Thank you really, for sharing your views! (Spared my wallet :) Hope you have a very lovely day! Thanks for the review, I love Estee Lauder! Thanks for the review! I am always trying to improve my night time skincare routine so thank you for the honest opinion! Too bad this line didn't work for you! I find EL skincare to feel quite luxurious but some products are definitely too rich for my skin. Aw too bad you didn't like them. I do love it when brands do gift with purchase though hehe. It's great to essentially try their other products for free! Thanks so much for sharing your honest thoughts with us on the line, beauty. I have sensitive, oily, acne prone skin and though this products seems to be harsher fro dry skin, I think it would irritate my sensitive skin by stripping away too much moisture and then not providing enough with the moisturizers in the line. Again, thanks for sharing and I hope you're having the best week so far, beauty! Thank you for the review! As someone with sensitive skin, I'd probably have to avoid these. It's a bummer though, because they SOUND like they would be good products. Thanks for the honest review! I usually really like Estee Lauder products, but haven't tried this particular line. Nice and honest review. Thanks for that. I have always liked and believed in Estee Lauder products. Haven't tried these though. I hadn't heard about this collection. I have dry/sensitive skin so I don't think these would work for me. But awesome review.